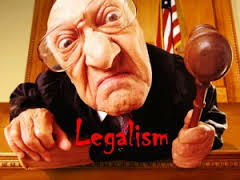 Legalism, in Christian theology, is a usually pejorative term referring to an over-emphasis on discipline of conduct, or legal ideas, usually implying an allegation of misguided rigour, pride, superficiality, the neglect of mercy, and ignorance of the grace of God or emphasizing the letter of law at the expense of the spirit. Legalism is alleged against any view that obedience to law, not faith in God’s grace, is the pre-eminent principle of redemption. One concept of legalism, the belief that salvation can be earned by obedience to laws, is referred to in various New Testament books, including Galatians. In this case, some Jews who had become Christians believed that in order to obtain salvation, both faith in Christ (as Messiah), and obedience to the Mosiac laws were required, such as the cases of the circumcision controversy and the Incident at Antioch. Generally, however, these cases are referred to as the Judaizer controversy, rather than a legalism controversy, but the two are related. Legalism refers to any doctrine which states salvation comes strictly from adherence to the law. It can be thought of as a works-based religion. Groups in the New Testament said to be falling into this category include the Pharisees, Sadducees, Scribes, Judaizers, and Nicolaitans. They are legalists because they emphasized obeying the Law of Moses, in the case of the Pharisees and Scribes, to the letter without understanding the concept of grace. Jesus condemned their legalism in Matthew 23. The Pharisees love of the praises of men for their strict adherence is said to be a prime example of legalism. Legalism is sometimes confused with obedience. New Testament books such as Romans, speak of grace and obedience together. An example is found in Romans 1:5 (New American Standard Version) speaking of Christ ‘through whom we have received grace and apostleship to bring about the obedience of faith among all the Gentiles, for His name’s sake…’ The goal of receiving the grace was to bring about obedience of faith. Here grace, faith and obedience are tied together. Other references are in Acts 5:29, 32; Romans 16:19; 2 Corinthians 7:15; Hebrews 5:9. Legalism is also confused with discipline, which is often spoken of in a positive light. See 1 Corinthians 9:17; 1 Timothy 4:7; 2 Timothy 1:7 and Hebrews 12:5–11.